"On their new opus "Zwischen Asgard & Midgard" THRUDVANGAR present eight anthems full of grandeur and atmospheric density. Dreamy, heroic and mystic pieces await the listener, taking him or her on a journey to a time long forgotten. A definite must for Viking Metal disciples!" "With “Zwischen Asgard & Midgard” THRUDVANGAR seamlessly tie in with the predecessor. In epic broadness and with fists held high Viking anthems roar above the listener, spreading a fascinating darkness, the perfect atmosphere to walk on bifrost between the worlds. Restrained use of keyboard sounds and instruments accentuate and underline the grandness of “Zwischen Asgard & Midgard” overall character. 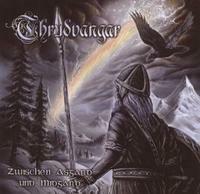 A gem of pagan-metallic song art...."
"Thrudvangar have constistently followed the chosen stilistic path. For fans of Pagan this CD is a must buy."